This durable plastic EDSS Pad is used in conjunction with the EDSS Shoe. 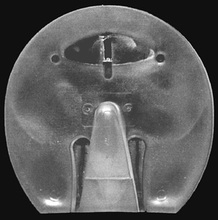 It has a stainless steel insert embedded in the toe region for a firm (seated out) attachment to the shoe. The molded EDSS frog inserts attach to the ‘keyed’ base on the EDSS Pad. The height of the frog inserts can be adjusted to increase or decrease support through the Impression Material to the frog, bars and sole of the foot. This will help enhance blood circulation and heel expansion. Pad sizes (SMALL:00-0, MEDIUM:1-2 & LARGE:3-4) correspond to EDSS shoe sizes.